If you’ve talked to me about SEO, you know keyword research is at the heart of my SEO process. I’ve long believed it is a core part of search engine optimization and I focus an entire lesson on it in my online SEO course. For years I’ve lived by the Google Adwords Keyword Planner. I knew the data was skewed towards pay per click advertisers, but honestly, I didn’t care. I could put in my own suggestions, import a keyword seed list, or even a URL and receive back hundreds of ideas with monthly search volumes. I was happy because it served both me and my clients well. Oh Google, Why Have You Forsaken Me? Then last week something changed and I felt as though my SEO world crumbled. I’m okay with change and adaption, but when you take away an old friend, I’m a bit saddened. And that is what happened. Google stripped away search volumes in their Adwords Keyword Planner and left us users with extremely vague ranges of search that are virtually useless. You can regain these figures, but you’ll need to start an Adwords PPC campaign and spend an amount big enough to bring back your data. I’ve always referred to PPC as digital cocaine for marketers, so I’m not willing to do that just yet. I’ve been a Google cheerleader for over a decade. Almost fifteen years in fact. I’ve always supported their tactics and felt that they were in the best interest of their users. But this one I can’t quite get behind. I’m baffled by it and I felt like I was shunned. But I’ll move past my heartache and I’ll focus on finding a new source of information. So What’s a Jilted SEO Girl to Do? Set out and dig through all the Keyword Planner alternatives I could find and document my findings. So I did just that on Friday and Saturday. And today, I’m giving you my findings. There are some good options available. Some are free and some cost money. With anything in life, the really good stuff will require you to spend a little money but I think you and I both expected that to be the case. Before you jump into my list, let me quickly state that I do not recommend all of these as suitable options. My goal is to provide you with a complete list of all the Keyword Planner alternatives I reviewed and detail out the information I gathered along the way. What Are My Top Choices for Best Keyword Research Software? If you’ve read through my list and tried each option out, you might be a little confused still and just not sure which one is right for you. After all, I did give you lots of options. While I gave you my pros and cons, your list of favorites might look a little different. Everyone is unique with different needs and objectives. Thus there isn’t a right or wrong answer here. There are just lots of options. I already have a subscription to Spyfu and I think this will work great for checking search volumes and looking for keyword alternatives on a day to day basis. The reports are great and my subscription offers me valuable information on my websites, my competitors, and my SEO clients. Spyfu will fall short when I’m doing a major revamp our websites or when I’m working when a new client has engaged me for SEO consulting. In those cases, I desperately need the import feature so I can bring in hundreds of keywords from my own seed list of ideas. I absolutely have to have a software tool that allows both import and export and really can’t live without these features. The only Keyword Planner alternatives I found that offer this are KW Finder and the Moz Keyword Explorer. Of those two options, both offer geographical segmentation but only the Moz Keyword Explorer supports the use of negative terms. So for me, the best option is Moz’s Keyword Explorer. I know this tool is expensive and I wouldn’t recommend it for the average website owner. Yet for SEO consultants, it is necessary and the $50 per month is worth it because it will save quite a bit of time. If you are a user of my SEO courses, please do not think you have to go the Moz route with me. 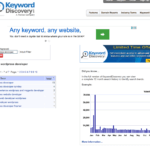 I’d suggest the KW Finder as it offers a lot of great information for a fraction of the cost. If you’re attending my upcoming SEO Bootcamp, we’ll be using a lower cost alternative and I’ll finalize this as we get closer to the event. Feedback Request: If you’ve already moved over to one of these tools, I’d love to hear your thoughts. Drop a comment below and let our readers know which Keyword Planner alternatives worked for you. Hi Rebecca, thank you for breaking down the alternatives. With most pricing ranging from $50 to $279 per month the “little guys” are left out once again. Not sure why at least one vendor doesn’t jump on the huge market opportunity by offering smaller tiered plans or day passes. It’s like they all work in lockstep. Definitely not unique to SEO market but bummer nonetheless. I feel your pain, Mark. I’m one of the “little guys” and am frustrated with this change by Google. I’m curious, have you taken a look at Keyword Keg? I could handle $8/month if it does the job. I liked Keyword Keg a lot. It didn’t have an import option, which is a show stopper at my volume. The rest of it looked really good. This is awesome. I’ve been forlorn. Also, does this motivate you to take on campaigns for others so you can get more volume? Some have had that reaction. That’s not my area so this post is my salvation. I have zero motivation to move into PPC management. I doubt think it would be right, since it isn’t my area of expertise. I’ll just pay for third party tools as needed to support our efforts and that of our SEO clients. Rebecca, I can’t thank you enough for your post. SEO is frustrating enough for me, I really didn’t need this! Which of the free options, or combination thereof, would be the best place to start for those of us who don’t bill anyone for SEO? Love your table and will study it often, but different companies have different approaches to how much they cripple their free version. I’d recommend you give each of the free or lower cost ones a try to see if any fit for you. As you and I both stated, there is no right solution for everyone. Users really need to see what fits with their process, data needs, and budget constraints. This is a great and VERY relevant resource for those of us who value digital marketing and really do want to get more traffic . I’ve used Semrush but the price was just too high to continue with it. I’ve demo’d MOZ and like it and may try it again since reading your guide. It is still pricey but may be manageable if it can provide enough value to our company. Thanks Rebecca for taking the time to put this together, I’m sure many will find it useful. Appreciate your feedback on semrush and Moz! Thank you so much for this information. I was unaware that Google had removed the search volumes last week and very disappointed about it. I appreciate your review and list of alternatives and will be trying KWFinder. p.s. I’m curious as to why you didn’t have WordTracker on your list. I’m not sure why WordTracker was left off, but a quick review of it shows I need to investigate further. No problem. I signed up for a three month subscription with WordTracker because of a discount promotion they ran recently but found that I still went back to keyword planner because I many times deal with keywords with lower volumes and WordTracker wouldn’t always show me volumes for those. I do really like the look of KWFinder much better than WordTracker and look forward to trying it out soon. What the….?! That’s what I thought when signed on to check a new set of words on Friday. Thanks for being so on it. I am now especially glad I signed up for the SEO Bootcamp In January. I’ll be adding this information to the diyseocourses.com content next week as well as modifying the SEObootcamp.com material. SEO is always an adventure. I’m signed into our account and we can see the planner. Where abouts have they removed it from, just USA based login’s as we’re in Australia maybe? Charles did you run any searches? Everyone can still see the planner, it is the volumes that are the issue. Volumes used to appear similar to 6,000 and now I see 1K – 10K. So you can still run inquiries, you just don’t have actual search volumes. My pleasure. I’m glad I could help. Appreciate your feedback on the KW Finder software Mark. Uh oh, you are out of limits! Hi guys, great article.Appreciate your feedback on the KW Finder software Mark.